It should be pretty obvious by now that I’m pretty excited about the discovery of Homo naledi announced on September 10. Sure, there are some known unknowns, but it’s just such a cool story! From the cavers (not, I learned, spelunkers [but I maintain that “spelunkers” is way more fun to say]) who first spotted the remains, to the team of “underground astronauts” that extracted them, to the cohort of experts that spent six weeks figuring out what they had, it’s a fabulous example of how dynamic science can be. In my posts on the subject (see parts 1, 2, and 3), I suggested that this is exactly the kind of science that should be brought into the classroom, as it is anything but rote, boring, or buttoned-up. I also mentioned that one teacher, John Mead, had struck up a friendship with paleoanthropologist Lee Berger and thus had the inside scoop on the Homo naledi fossils. 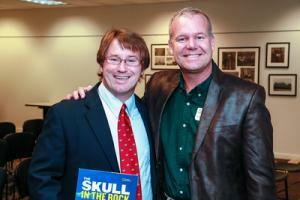 Mead teaches sixth- and ninth-grade biology at Saint Mark’s School of Texas in Dallas. I had the pleasure of asking Mead some questions, and our exchange (slightly edited) is below. Stephanie Keep: Take me back to the beginning. How did you end up as an insider of this incredible discovery? John Mead: My connection with Dr. Berger started in August 2012. Sometime prior to that, we had become friends on Facebook. I was aware of his discovery of Australopithecus sediba and was planning to teach about it in my class during the upcoming year. I rather boldly asked him via Facebook whether he would be interested and willing to serve as a consultant for my middle school classes when we talked about A. sediba. I fully expected him to politely decline and say he was busy. But instead, he offered to talk to my class when he was in town later that year. After some discussions with the Perot Museum here in Dallas, we arranged for him to visit my students in the morning and then present to a joint audience of Perot members and St. Mark’s families that evening. Mead and Berger in 2012 after he spoke at St. Mark's. Photo courtesy J Mead. At dinner after a fantastic presentation, Dr. Berger invited me to visit him in South Africa. I was able to secure a grant that allowed me to get to Johannesburg and in June of 2013, I spent a week with Dr. Berger and his team visiting the Malapa fossil site as well as other fossil sites in the Cradle of Humankind. As a result of this connection, when the Rising Star fossils were discovered in late September 2013, I was lucky to be included in the announcement e-mail. Several days later, the “skinny scientist ad” appeared on Facebook, and I knew something exciting was going to come of it. Once the team was assembled, they began to live tweet their activities. Thanks to the time difference between Dallas and South Africa, my 8:00 a.m. classes were able to see live tweets from the team and interact with them. However, my afternoon classes took place during the South African nighttime. So they received my narration of the day’s activities at the Rising Star site. By the second day of the excavation, I realized that all of the tweets were going to be lost to the ether of the Internet. So I recreated what I was doing in my afternoon class and recorded a video narration of the tweets of the day from Rising Star. I then placed these videos on my blog for my students as well as the rest of the world to follow along with. 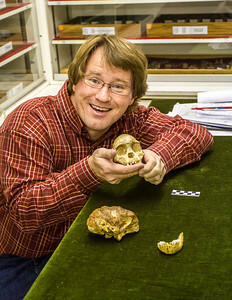 Mead, on his 2013 visit to the Cradle of Mankind, got to hold the actual Taung child fossil. To say I'm jealous is a massive understatement. Photo courtesy J Mead. One of the great stories that came out of this was getting to know the advance scientists (also known as the underground astronauts). One night I saw a long post from Lindsay Hunter on Facebook. In it, she described in detail how the skull was brought up from the fossil chamber to the surface. I asked her if I might read her post into my nightly “play by play.” She did me one better and offered to record it on her phone and email it to me. Less than a half hour later, I had an eight-minute audio description of the skull recovery. I was able to play that for my students in class the next morning. Needless to say, it was a huge hit. Shortly afterward I learned from Ms. Hunter that she was connected with the University of Texas in Austin. Plans were soon made to have her come visit my students in January once she was back from South Africa. Her visit in January 2014 was tremendous—she enthralled everybody she met with stories from Rising Star. Fast forward to November 2014. Dr. Berger was visiting Dallas and stopped to share what he could about the Rising Star expedition with our middle and upper school students at St. Mark’s. His presentation amazed everyone who saw it and I received lots of comments like “It was the best assembly EVER!” After that visit, we began to discuss plans to have me come back to South Africa to see the Rising Star material and think of ways to share the discovery with younger students. 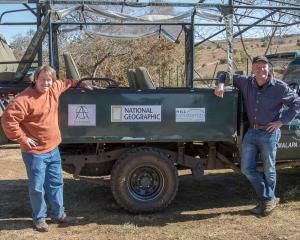 Mead and Berger in the field, July 2015. Photo courtesy of J Mead. With the help of a professional development grant from St. Mark’s, I was able to spend two weeks during July 2015 in Johannesburg with the Rising Star team. During this time I had the opportunity to visit the Rising Star cave (although not the actual fossil chamber) as well as other promising sites throughout the Cradle of Humankind. I also had the chance to assist scientists who were working on analyzing some Homo naledi teeth. During this visit I interviewed many members of the team including Dr. Berger, Dr. Hawks, and most of the members of the exploration team. Upon my return to Dallas, I expanded these interviews to include all of the six advance scientists/underground astronauts via Skype. As I share this, we are very excited for Dr. Berger’s return visit to St. Mark’s today, September 30, to share details of the Homo naledi discovery and analysis that the publishing embargo prevented him from sharing during his visit last November. SK: I think we can all agree that so far, this story is pretty fantastic. In part 2, John Mead talks about the importance of Homo naledi and explains how he shared it with his students. More fantastic to come!